We love Thailand and it will always hold a special place in our hearts. So after an engagement on a beautiful beach on Koh Samui, this was the obvious place to get married. After many trips to Thailand, we have had occasions when things haven’t exactly gone according to plan. I knew having a wedding planner would eliminate any stress or problems that were bound to happen. I contacted Take Us To Thailand and instantly knew this was a very wise decision. We decided on a trip to Koh Samui (any excuse to return) where Take us to Thailand set up visits to the locations we were considering for both our pre wedding cocktail party and wedding. Anna and her marvellous team asked us all the right questions and made the perfect recommendations for venues, food, drinks, styling, makeup and hair stylist, photographer, videographer, musician, celebrant and DJ. We couldn’t be happier with each and every one of the team who helped create this magical day. The entire process was easy and stress free as Take us to Thailand had so much information on every single facet of ‘wedding’ paired along with their extensive local knowledge. This enabled us to feel very well informed with all decision making. There was never a moment when I felt overwhelmed or stressed, as the team at Take us to Thailand are very well organised and I trusted them completely. Nothing was a problem for the team, even with our ever changing guest list. As I walked down the aisle with my man, it took my breathe away. Looking at our family and friends with the gorgeous ocean as a backdrop, is an image that will remain with us forever. Everything about the ceremony was so beautiful. Anna told the celebrant about our ‘story’ and he spoke every single word with such care, compassion and consideration so specific to our circumstances. We all melted. This was also evident in Tony’s heart warming video (our family and friends still look at this regularly), Corbin’s stunning photos and the incredible music from Mark. The word that best describes our reception is ‘magical’. Take us to Thailand’s attention to detail is apparent. 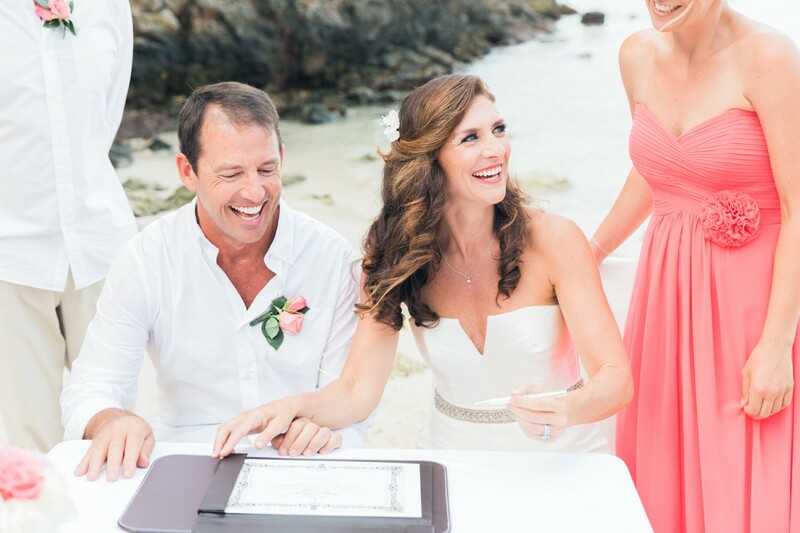 The team created a simple, elegant and relaxed atmosphere on the beach which was truly breathtaking. The fairy lights, lanterns, table styling, the selection of white flowers, background music, the fireworks. Yes, we had fireworks. Every single second of the entire day was PERFECT. The food was the best I’ve ever had in my many years of visiting Thailand. Four Seasons were even happy to make our somewhat unusual request for our wedding cake based on our favourite Thai dessert. You have never seen a mango sticky rice quite like this. All the staff had smiles on their faces and looked liked they were enjoying themselves too. Everything ran smoothly. The total experience was way beyond our wildest expectations. Every single person said this was not only THE best wedding they have ever been too, but one of the best days of their lives.Scott and I really did have that perfect wedding you dream about. Thank you Anna and Take us to Thailand for turning our dream into a reality.